Transform an everyday task into something you enjoy. The energising Peppermint aroma of our Foaming Hand Wash awakens the senses as the rich, naturally sourced ingredients leave your skin clean, soft, smooth and moisturised. Ideal for the bathroom as well as the kitchen. Our Peppermint Foaming Hand Wash is free of these unnecessary ingredients. Natural Peppermint Oil provides its invigorating scent. The luxurious foaming action is due to Earth-friendly Coconut and Apple Amino Acids. Panthenol, Allantoin and Aloe combine to provide extra moisture and soothing properties. Wet hands. Dispense 1-2 pumps of Peppermint Foaming Hand Wash onto hands. Scrub. Rinse. Scrub hands and each finger, including cuticles and under nails. Rinse and dry hands thoroughly using a clean microfibre towel. When refilling the dispenser with the refill, leave about 2 cm of space between the hand wash and the top of the bottle to allow for creation of foam. Package is recyclable, HDPE #2. Economical refill product is available, saving you money and creating less packaging waste. Disodium Cocoamphodiacetate (EWG ranking: 0) — Derived from Coconut Oil, this surfactant gently cleanses the hands. Glycerin (EWG ranking: 0)— Vegetable-based humectant that draws moisture to the skin, hydrating the hands. Coco-Glucoside (EWG ranking: 0)—Mild surfactant derived from the dried pulp of the Coconut fruit and sugar. Well-tolerated even by those with the most sensitive skin. Sodium Cocoyl Apple Amino Acids (EWG ranking: 0)—Mild surfactant derived from Apple Juice Essential Amino Acids. Mentha Piperita Oil (EWG ranking: 1)—Commonly referred to as Peppermint, the thin, brittle leaves of this plant emit an aromatic and cooling aroma. Peppermint comprises a high percentage of natural essential oils, as well as Menthol and Tannins. It is known for its refreshing, cooling, antiseptic and anti-irritant properties. Aloe Barbadensis Leaf Juice (EWG ranking: 1)—Contains vitamins, minerals, enzymes and natural sugars and has a pH almost identical to that of skin (4.5 – 6). Aloe helps hydrate, soothe, nourish and protect the skin. Panthenol (EWG ranking: 1)—Also known as Vitamin B5, Panthenol nourishes and lends moisture to the skin. Allantoin (EWG ranking: 1)—A soothing anti-irritant and skin protectant that increases skin’s water content. 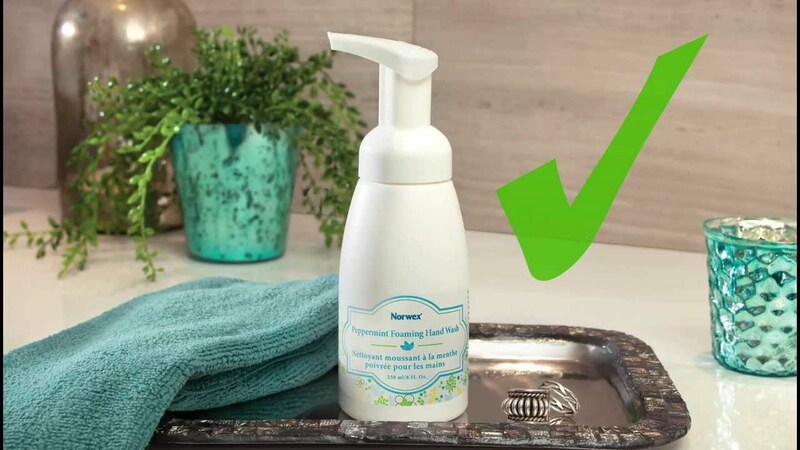 Foaming hand soaps are better for the environment than bar or liquid soaps. Because you use less product, less waste goes down the drain. The number of germs on your fingertips doubles after you use the restroom. Try to avoid touching your face with your hands. Here's why: According to WebMC.com, about 80% of infectious diseases are transmitted by touch. When you unknowingly touch your face, the germs can enter through your eyes, nose and mouth. And those germs can also be transmitted to others through shaking hands (direct transmission) or handling items that others then touch (indirect transmission).